How do I register for Family Camp? Print out a registration form here and mail in with your payment. For other registration questions visit our registration page. When can I arrive to Family Camp? check in by mid-afternoon if possible so you’ll be settled and ready to enjoy the evening events. Where do I check in when I arrive at Family Camp? RV and tent campers should go to the Meadowview RV Park check in building upon arrival. Campers who will be staying in a dorm or hotel style room will check in at the Oakwood Center lobby. Please check in immediately upon arrival before you begin any set up of your camp site or attempt to participate in any activities. Can I have guests visit during Family Camp? Yes! Day guests are welcome to come and enjoy a full day or any portion of a day. The day guest rate is $15.00 for ages 12 and up or $8.00 for ages 3 through 11. Day guests may pre-register at OhioFamilyCamp.com. For day guests only coming for the second half of the day, a 50% discount will be given after 1pm (excluding Sunday). Please be aware that activity signs ups will likely already be full and closed by 1pm each day. Can we attend Family Camp just for the evenings? Yes! You can register on site to attend the second half of each day only. The discounted rate for campers arriving daily after 1pm is $7.50 for ages 12 and up or $4.00 for ages 3 through 11. How can I purchase meals? You can pre-register for a full week meal package when you register. If you would prefer to purchase meals onsite, you will be able to pay by credit card at the registration/information booth in the Oakwood Center daily or pay with cash/check at the door at each meal. A menu for the week will be available beginning on Sunday, July 1 at the onsite Family Camp registration/information desk. What do I need to bring to Family Camp? Bring everything you’ll need to enjoy a week of Family Camp! Click here for a list of suggested items to bring. Where is the schedule for Family Camp? A tentative schedule of events is located at OhioFamilyCamp.com. How do I check my kids in to their class before the services and where do I pick them up at the end? Children who will be in the nursery or kids services during the morning sessions will need to be checked in by a parent. Check in locations will be explained in the opening session on Sunday, July 1 at 7pm. At the end of each session, infants and children must be picked up by their parent or a pre-approved guardian. Please specify who may pick up your child when you complete the online or printable registration form. Wifi may be available in some places during Family Camp. We do strongly recommend that you avoid using wifi and electronic devices when possible to allow you to enjoy an “unplugged” week with your family and friends. If the need does arise for you to connect to a wifi signal, you may inquire at the registration/information booth to see if wifi is available at that time. Can we bring fireworks for the 4th of July? No. 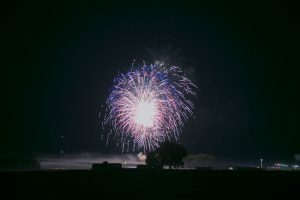 For the safety of all guests and to comply with fire codes as well as state laws and Heartland’s insurance regulations, no type of fireworks may be brought to Heartland or used by any guests. This includes sparklers. Where can we see fireworks for the 4th of July? A fireworks display is usually held adjacent to Heartland’s property one evening during Family Camp. We do not yet know the date and time for this display, but will update this document and the event schedule when the information is released to us. 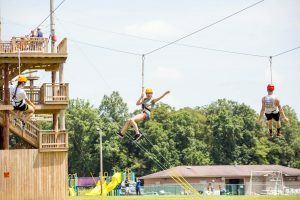 What non-scheduled activities are there to do during Family Camp? 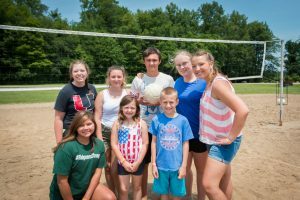 Some activities to enjoy at your leisure during Family Camp include hiking nature trails, volleyball, basketball, Human Foosball, 9 Square in the Air, Gaga Ball, and playgrounds for children. Guests are also encouraged to bring indoor and outdoor games to play and invite others to join in! How do we sign up for scheduled activities? All campers must sign up to participate in the facilitated afternoon events. The signs ups will be available each morning at 9:30am in the Oakwood Center. Are accommodations made for special diets and food allergies? Heartland’s Food Services team are available to talk with guests who have food allergies. 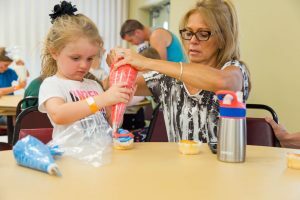 They can answer questions about ingredients and preparation to help guests discern whether a food item will be safe for them considering their allergies. Just look for the smiling people in the blue Heartland shirts! We do ask that you please report any severe food allergies to us on the registration form when you register. If you have any questions, contact Heartland at 740.747.0220 or by emailing carissa@heartlandretreat.com. Can we bring our dog to Family Camp? Dogs can only be in the Meadowview RV Park area and must be leashed and also secured when you are away from the campsite. For the safety of all guests and in compliance with Heartland’s rules and insurance requirements, no unapproved ATV’s may be brought to Family Camp or used by guests. The only approved ATV’s will be in use by event security. How can I rent a golf cart to use during Family Camp? Golf cart rentals are available on a first-come-first serve basis and must be reserved by May 29. The rental fee is $180.00 for the full week of Family Camp (Sunday-Friday). Drivers must be at least 21 years of age and provide proof of valid car insurance upon arrival to Family Camp.